Inspiring You has joined forces with Salthill Village and Steeltech Garden Sheds to help raise awareness about plastics pollution in our seas and with your help – end it. 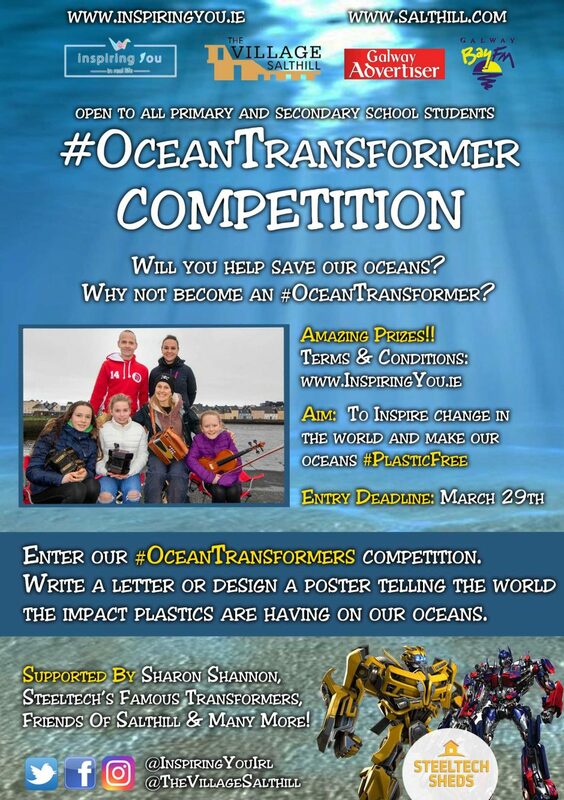 We are asking primary and secondary school students across Ireland to enter our “Ocean Transformers” competition. All you have to do is write a short message or design a poster encouraging people to take action and “Save our Seas” from plastic pollution. Inspiring You are a group of Galway based friends who work in education and media. Their aim is to try and encourage young people to engage in more real life activities and use social media less. Galway has long been a leader in tourism, arts and culture. The team at Salthill Village were very enthusiastic to help inspire young people to dream of a better future for our environment. 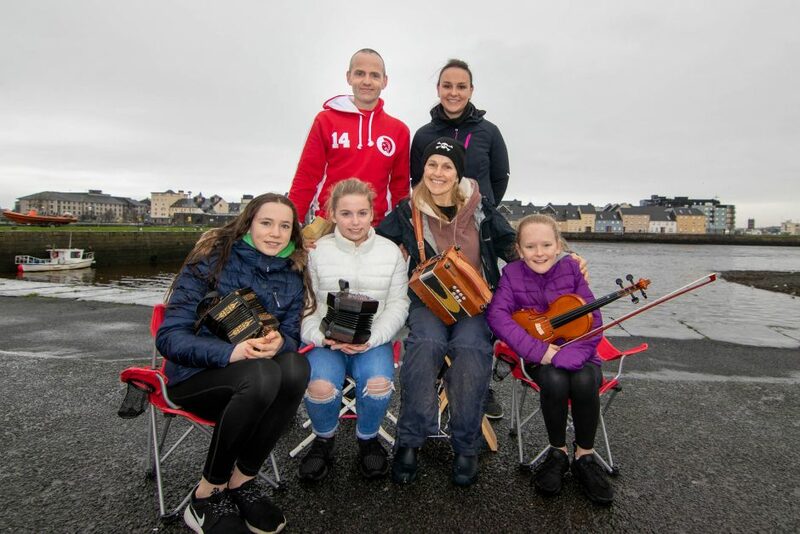 One of Ireland’s leading musicians and passionate environmentalist Sharon Shannon and Marine biologist Catherine Jordan have been part of this project with “Inspiring You” since its inception. Salthill is known for its beauty, scenery and famous prom – we want to keep it that way. 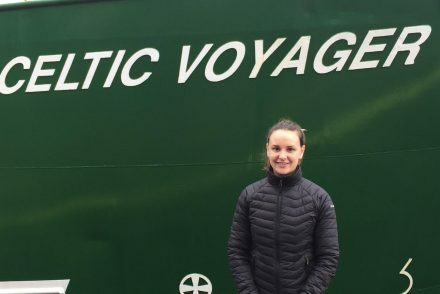 The mid- point on The Wild Atlantic Way is one of Ireland’s leading tourist destinations and has been immortalised in song by Bing Crosby’s version of “Galway Bay“ and more recently by our very own, “Galway Girl”, Sharon Shannon. The “Transformer” movie franchise is one of the highest grossing in history. One of Ireland’s leading businesses, Steeltech Garden Sheds, were delighted to lend us, “Optimus Prime” and “BumbleBee” to help encourage young minds to become “Ocean Transformers”. Optimus Prime is known for his “Message to the World” so we are excited to see what the students of Ireland’s , “Message to the World” will be through art and writing. The two winners will receive great class prizes. The student/class who submits the winning message will receive a “Land and Sea Tour of Galway” for 25 students. Young people are the future leaders of tomorrow so we need you to help raise awareness about plastic polluting our oceans today! Students can enter as an individual, a group or a class. The deadline for entering is 5pm on Friday March 29th. Email philip@inspiringyou.ie for any queries. Galway Bay FM, Galway Advertiser, athletics great Catherina McKiernan, actor Eugene Horan, Galway City Tours, Galway Bay Tours and Kamil Films are all proud supporters of the, “Ocean Transformers” competition.